CaliforniaCarbon.info, November 5, 2015: According to data released by the California Air Resources Board (ARB), emissions from sectors covered under the second compliance period (2015-17) of the California cap-and-trade program fell by 1.6% in 2014, to 342,809,374 tCO2e. 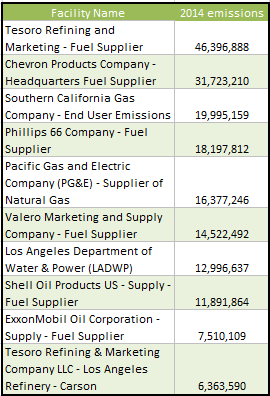 This is in line with the CaliforniaCarbon.info 2030 emissions forecast model, which estimated 2014 covered emissions at 342,340,720 MTCO2e, missing the mark by 0.1%. 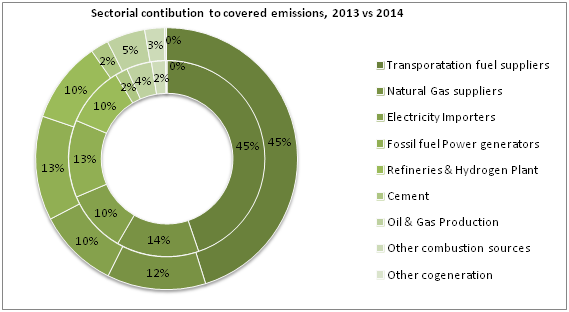 Covered emissions for the first compliance period (2013-14) increased marginally in 2014 to 146,120,333, 0.77% up on 2013’s total of 144,999,976. Californian entities were hence required to submit allowances and offsets to cover a total of 291,120,309 tCO2e across the first compliance period, with an additional 36,664,703 instruments required of covered entities from Quebec. 322,181,742 V2013 and V2014 allowances were held in the various compliance and holding accounts at the end of the third quarter of 2015, in addition to 2,040,026 non-vintage early action allowances from Quebec. Furthermore, entities may use offsets and true-up allowances to meet a portion of their obligations. Last year, 1,687,432 offsets and 1,758,738 true-up V2015s were surrendered. This leaves a carry-over long position of 34.5 million at the end of the first compliance period, in addition to whatever amount of offsets was used for this month’s surrender. As has been reported in various channels, the biennial surrender fell short of 100% compliance by some 500,000 tCO2e. As a penalty for non-compliance, instruments equal to 2,000,000 tCO2e need to be surrendered by mid-December this year, which could slightly shorten the stated oversupply. CaliforniaCarbon.info expects covered emissions to decline by 1.0% to some 338.9 MMtCO2e in 2015 and by a further 6.0% to 322.2 MMtCO2e in 2020. Under the base case assumptions, CaliforniaCarbon.info estimates that the oversupply being built up in the WCI carbon market would not be fully eroded until 2027.